Why dedicate an entire room as a guest bedroom when you have overnight family/company just once or twice a year? 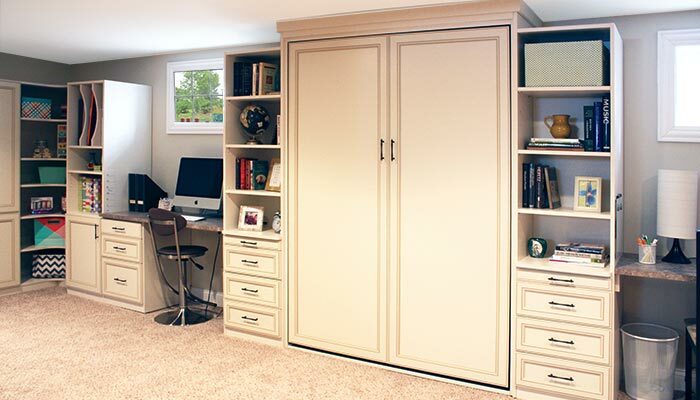 This Chicago area homeowner wisened up by calling Closet Works to design a more efficient use of the space — allowing the family year-round use of this room for all sorts of activities. Multiple built-in desks provide dedicated space for a home office and areas for homework, studying or arts and crafts work. The Queen size wall bed remains in the closed position most of the time, allowing a lot of open floor space that can be used for yoga, aerobics, gymnastics practice, garage band (without the garage) and all sorts of activities that require a large expanse of soft, sound absorbing carpeting that is uninterrupted by furniture placement. When a guest bedroom is needed, the queen size wall bed folds out and two pull-out bedside tables created a very comfortable guest bedroom on the homes lower level. There is still room for a nice size television in the wall unit, further adding to the versatility of the room. Rounded shelving in the corner keeps the angles soft and a vertical divider provides space for art projects, oversize books and even games or puzzles. On the surface, the idea of a guest room in the basement may seem unwelcoming to many. However, this multi purpose basement rec room/home office/overnight guest room proves that that even below grade space can be warm and inviting. With the right bedding and accessories, this fold away bed transforms the room into a very elegant and welcoming multi purpose guest room. The storage system that surrounds the Murphy bed offers hidden pull-out bedside tables in addition to shelves and drawers. 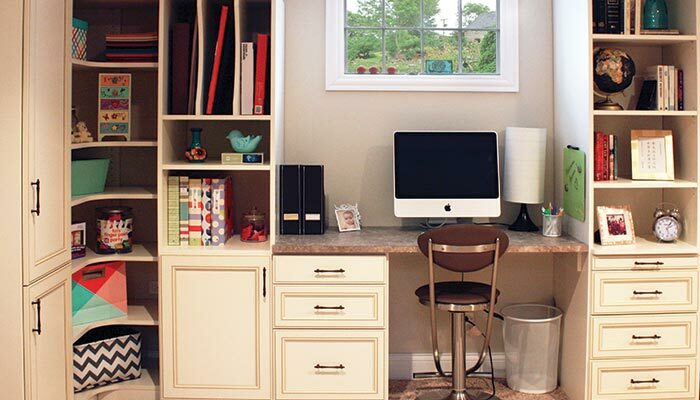 The wall unit desks provide a place to work from home, pay bills or help a child with homework. A wall unit with shelving and cabinets wraps three sides of the room. This lower level multi purpose space is ready for activities when the wall is bed closed. The wall unit desks include curved shelves in the corner and plenty of vertical storage. This custom designed home office / multi purpose space with wall bed maximizes versatility and available space by using a fold-away queen size Murphy style wall bed to handle the guest room conversion!